The largest gathering of alumni, parents, students, and friends of Notre Dame in Asia came together this weekend in Beijing. Centered around Notre Dame International’s seventh Greater China Scholars Weekend, an annual event celebrating the top twenty high school applicants to Notre Dame from the greater China region, the Notre Dame community proved it is flourishing and excited about the future. 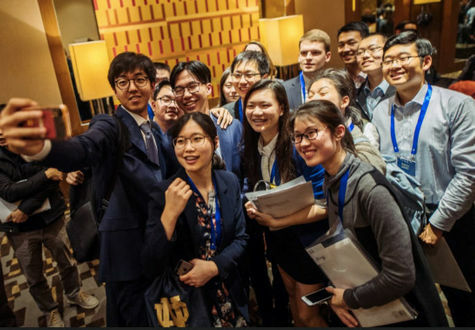 The Greater China Scholars program, designed to promote global leadership and service, is the University of Notre Dame’s largest scholarship program for international undergraduate students with a cohort of 45 scholars currently enrolled at Notre Dame. Led by Dr. Jonathan Noble, assistant provost for Asia and Beijing Global Gateway director, the Greater China Scholars program has received generous support from the Li Ka Shing Foundation, the HS Chau Foundation, and numerous alumni, parents, and friends. Dr. Michael Pippenger, vice president and associate provost for internationalization, addressed the parents: “Please know that we welcome your sons and daughters into the Notre Dame family with open arms, and support them through their education in all ways—mind, body, and spirit—to become the leaders who know and do what is right to promote good in the world.” Current parents of Notre Dame students provided insight, perspective, and advice for prospective parents, while alumni shared that their relationship with Notre Dame extended far beyond their college years. All were excited to welcome the scholars and their parents into the Notre Dame family. Located in the embassy district, next to a modern art museum and along the historic Liangma Canal, the Beijing Global Gateway’s new space will be dedicated in October 2017. The Gateway enhances the University’s presence and cooperation in the region by serving the entire University community, including students, faculty, community of alumni and parents, and partners in the public and private sectors. The Gateway is located in a new state-of-the-art office building and provides classroom space for students and lecture and seminar space for faculty and guest speakers. The Gateway also assists University departments, such as undergraduate admissions and the alumni association, to facilitate their operations in China and the surrounding region. Its proximity to multi-nationals, international organizations, and governmental offices enhance opportunities for faculty and students to engage with the larger society as well as the academic community in Beijing and the region. Contact: Joya Helmuth, (574) 631-2772 or jhelmuth@nd.edu. Originally published by Joya Helmuth at international.nd.edu on March 21, 2017.